Though many associate Hawaii with picture-perfect romantic getaways, the Aloha State is an even better destination for multigenerational families! The island of Oahu, nicknamed “The Gathering Place,” boasts a unique culture and landscape that everyone in your crew will absolutely adore. Below, we’ve compiled everything you need to know as you plan an Oahu family vacation everyone will remember for years to come. For a complete list of local tips, hidden gems, and family-friendly recommendations, be sure to request access to our complimentary Travel Guide to Oahu! Who better to trust with travel tips than the locals themselves? We strongly recommend reaching out to resident business owners for their recommendations before heading to Oahu with your loved ones. At Hawaii Beach Homes, we’re especially dedicated to meeting your family’s unique vacation needs. We live here on the island and are happy to provide you with our favorite restaurants on Oahu, kid-approved activities, and fun attractions. If you’ve already looked through our blogs but still have questions, get in touch and we’ll be more than happy to assist. There is no “bad time” to visit Oahu. Our island is bathed in sun year-round and temperatures are typically very comfortable. If your family is into surfing, we recommend visiting in the winter—that’s when major competitions like the Vans World Cup take place. Oahu is also an incredible place to spend the holiday season (no snow)! If your family just wants sand, sun, and swimming in the surf, summer is a good time to visit. Summer on Oahu means gentler waves, warmer temperatures, and increased activity at wildlife-centric attractions like Turtle Beach. Spring is ideal for whale watching on Oahu, while fall is a superb time to enjoy off-the-beaten-path Oahu activities like going for a lighthouse hike. No matter what time of year you visit, you’ll be met with plenty of fantastic family activities! Your Spacious Vacation Rental in Paradise Is Waiting! 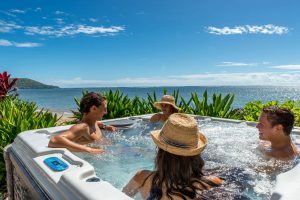 Now for the “where” and the “why”: A private beach house is the absolute best place to stay on Oahu, especially for multigenerational families. Everyone will love having their own space to sit back, relax, and take in the beauty of the beach! At Hawaii Beach Homes, we’re committed to making your dream vacation a reality—without the booking fees found on travel agency sites. All of our properties on the North, South, and Windward Shores of Oahu are just steps away from the beach and offer premium amenities found nowhere else! We offer both small and large properties (up to 10 bedrooms!) perfect for everyone in your group. The only challenge is getting everyone together to choose between them all! Consisting of just 529 square miles, Oahu features many grand adventures within driving distance of one another (and of your private vacation rental). Each day of your vacation, you can choose several Oahu points of interest. You, the kids, and the older family members need to experience breathtaking vistas of the ocean, stunning mountain ranges, and the fun activities waiting in Honolulu. What are you waiting for? The spirit of Aloha is calling! If you’re ready to book your family’s stay, check our availability today and get started planning! You Need to See Turtle Beach on Oahu! Here’s Why — 3 Reasons You Need to Attend This Year’s Pipe Masters!